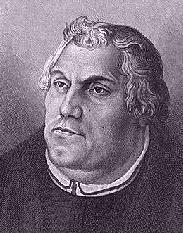 Martin Luther (1483—1546) is the figure most-closely identified with the Protestant Reformation. It was 500 years ago — on October 31, 1517 — that he nailed his 95 Theses to the door of the Castle Church in Wittenberg. It was not Luther’s intention to separate from the Catholic Church, but to draw to the attention of its leaders that some of its common teachings were contradicting what the Bible teaches. ----course of Western history for the better." In other words, celebrating the anniversary of the Reformation is not to further division between Protestants and Catholics, but to remember Luther, and the other reformers, who have helped all of us in our desire to follow the truth. Your burning love in them ignite. O Lord, what has your radiance done! People and realms of ev’ry tongue! For this, O Lord, your praises e’er be sung! O Holy Light, Shield Supreme! To call God, “Father,” from the heart. We place our trust in him with all our might. O Holy Fire, Cheer so sweet! Nor by our trials be driven away. Press on to you in heaven through grief and grave. *This is the second Kingdom Poets post about Martin Luther: first post.